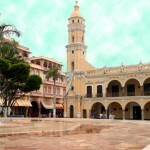 The city of Veracruz is in the state of the same name, and is the largest city in the state. Its on the coast of the Gulf of Mexico and is one of its largest ports. Because of its location it has wonderful weather, great beaches, and many other attractions which make it a popular vacation spot. Just remember, if you drive, a Mexican insurance policy (purchased online for the best deal) is vital because US and Canadian auto Insurance policies exclude the territory of Mexico. Look for VALUE and SECURITY when shopping as there is NO standard Mexican auto insurance coverage and many policies sold at the border are NOT Rated for claims paying ability. Visit Mexican Insurance Store.com for more about Mexico insurance policies. A historical site that is relatively close to Veracruz are the ruins of El Tajin. Most of it is an archaeological site, but there is still a lot to see. There are many examples of Mexican pyramids, monuments and statues, and there is also a museum where people can see some of the things they are not allowed to visit in person. The Veracruz Aquarium is one of the top aquariums in all of Latin America because its the most modern, and also sports a recreation area for families. Visitors actually walk around being surrounded by marine life throughout the facility, including the shopping areas. They have species of animals from all around the world, and one of their most popular exhibits is the shark tank. The beaches in the area offer things such as underwater diving and snorkeling, and of all things there are wrecked ships that people can view if they go out far enough into the Gulf. There are five different beaches within 50 miles of each other. Theres also an exciting nightlife in Veracruz City, with many restaurants and clubs, which makes Veracruz an exciting city to visit day and night. Another site that is relatively close, which shows how Mexico can remind many people of California in how fast one can go from one type of weather to another, theres Pico de Orizaba, the second highest volcano in North America. Right now it\’s a dormant volcano thats snow capped, and theres lots of mountain climbing. Its also near areas where there is white water rafting. Every Mexican insurance policy purchased from Mexican Insurance Store.com comes with roadside assistance throughout Mexico at no additional cost for your peace of mind. Mexico markets are the favorite place to eat foods on the cheap. Also, travelers can buy more to stock up foodstuff for a night trip. Previous post: Mexico Auto Insurance – Exploring Acapulco by Land and Sea!